Proteus vulgaris (P. vulgaris) is widespread in nature, mainly found in flora of human gastrointestinal tract. The current study was attempted to investigate the effects of Mr. Trivedi’s biofield treatment on lyophilized as well as revived state of P. vulgaris for antimicrobial susceptibility pattern, biochemical characteristics, and biotype. P. vulgaris cells were procured from Micro BioLogics Inc., USA, in sealed pack bearing the American Type Culture Collection (ATCC 33420) number and stored according to the recommended storage protocol until needed for experiments. Lyophilized vial of ATCC strain of P. vulgaris were divided in two parts, Gr. I: control and Gr. II: treatment. Group II was further subdivided into two parts, Gr. IIA and Gr. IIB. Gr. IIA was analysed on day 10. Gr. IIB was stored and analysed on day 143. After retreatment on day 143, the sample was divided into three separate tubes. First, second and third tubes were analysed on day 5, 10 and 15 respectively. All experimental parameters were studied using automated Micro Scan Walk-Away® system. 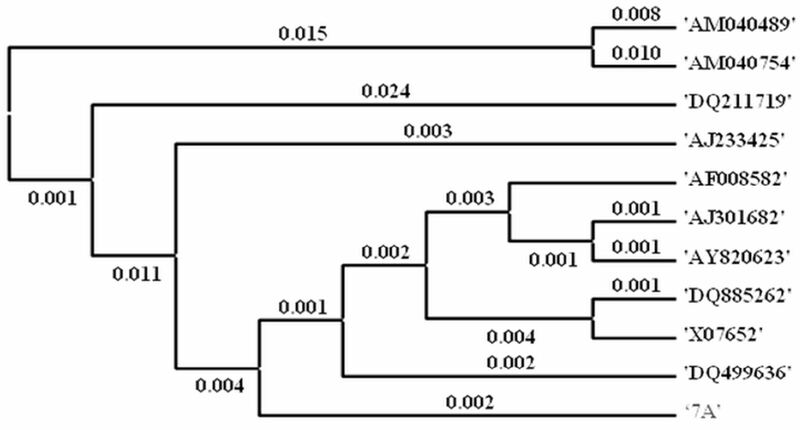 The 16S rDNA sequencing of lyophilized treated sample was carried out to correlate the phylogenetic relationship of P. vulgaris with other bacterial species after treatment. The antimicrobial susceptibility and minimum inhibitory concentration showed 10.71% and 15.63% alteration respectively in treated cells of P. vulgaris as compared to control. It was observed that few biochemical reactions (6%) were altered in the treated groups with respect to control. Moreover, biotype number was substantially changed in treated cells, Gr. IIA (62060406, Proteus penneri) on day 10 as compared to control (62070406; Proteus vulgaris). 16S rDNA analysis showed that the identified sample in this experiment was Proteus vulgaris after biofield treatment. However, the nearest homolog genus-species was found to be Proteus hauseri. The results suggested that biofield treatment has impact on P. vulgaris in lyophilized as well as revived state. Proteus vulgaris (P. vulgaris) is a genus of Gram-negative bacteria widespread in the environment and also found in normal gut flora of the human. Proteus ranked third as the cause of hospital-acquired infections . The organism is short rods shaped, motile, non-sporing and chemoheterotroph bacterium with diverse mode of transmission . It has a number of putative virulence factors such as secreted hemolytic, responsible for host cell invasion and cytotoxicity. Moreover, it induces urease enzymes which lead to overproductions of ammonia that precipitate and formed bladder and kidney stones. It also produce a secreted protease enzymes from fimbriae which promotes digestion of immunoglobulins . Ureido-penicillins, cephalosporins, aminoglycosides, imipenem, ciprofloxacin, and trimethoprim-sulfamethoxazole are the drugs of choice to treat P. vulgaris associate infections but it possess high level of resistance against penicillin and other antibiotics . Therefore, an alternative strategy is needed to alter antimicrobial sensitivity profile against P. vulgaris strain. Biofield treatment has been known as an alternative approach that may be useful to alter the resistance pattern in Proteus infected patients. Harold Saxton Burr, had performed the detailed studies on the correlation of electric current with physiological process and concluded that every single process in the human body had an electrical significance . Recently, it was discovered that all electrical process happening in body have strong relationship with magnetic field as mentioned by Ampere’s law, which states that the moving charge produces magnetic fields in surrounding space [6, 7]. Thus, the human body emits the electromagnetic waves in form of bio-photons, which surrounds the body and it is commonly known as biofield. Therefore, the biofield consists of electromagnetic field, being generated by moving electrically charged particles (ions, cell, molecule etc.) inside the human body. According to Rivera-Ruiz et al. 2008, it was reported that electrocardiography has been extensively used to measure the biofield of human body . Thus, human has the ability to harness the energy from environment or universe and can transmit into any living or nonliving object(s) around the Globe. The objects always receive the energy and responding into useful way that is called biofield energy and the process is known as biofield treatment. Mr. Trivedi’s unique biofield treatment (The Trivedi effect®) has been known to transform the structural, physical and thermal properties of several metals and ceramic in material science [9-11], improved the overall productivity of crops [12, 13], altered characteristics features of microbes [14-16] and improved growth and anatomical characteristics of medicinal plants [17, 18]. Due to the clinical significance of this organism and literature reports on biofield treatment, the present work was undertaken to evaluate the impact of biofield treatment on P. vulgaris in relation to antimicrobials susceptibility and biotyping based on various biochemical characters followed by 16S rDNA sequencing analysis. P. vulgaris, American Type Culture Collection (ATCC 33420) strain was procured from Micro BioLogics, Inc., USA and stored with proper storage conditions until further use. All the tested antimicrobials and biochemicals were procured from Sigma-Aldrich (MA, USA). The antimicrobial susceptibility, biochemical reactions and biotype number were estimated with the help of Micro Scan Walk-Away® (Dade Behring Inc., West Sacramento, CA, USA) using Negative Breakpoint Combo 30 (NBPC 30) panel with respect to control group (Gr.). The 16S rDNA sequencing study was carried out using Ultrapure Genomic DNA Prep Kit; Cat KT 83 (Bangalore Genei, India). Group I: ATCC strain was revived from lyophilized state and considered as control. No treatment was given and analyzed for antimicrobial sensitivity and biochemical reactions as per the standard protocol. Group II: The lyophilized state of ATCC strain was divided in two parts named as Group (Gr.) IIA and Gr. IIB. Both the Groups of ATCC strain of P. vulgaris in lyophilized state was subjected to the Mr. Trivedi’s unique biofield treatment (first treatment). After first treatment, the analysis of Gr. IIA lyophilized sample was done on day 10 for antimicrobial sensitivity along with minimum inhibitory concentration (MIC), biochemical reactions with biotype number and 16S rDNA analysis as per the standard protocol. Gr. IIB sample was stored in lyophilized state for 143 days at -70ºC. Gr. IIB was further sub-divided in two separate parts named as Gr. IIB - Study I and Gr. IIB - Study II. After 143 days, the reanalysis was performed for antimicrobial sensitivity, MIC, biochemical reactions and biotyping as per the standard protocol. The stored strain was revived from -70ºC and the revived culture was again subjected to Mr. Trivedi’s biofield treatment (re-treatment) on day 143. After biofield retreatment, the sample was sub-cultured into three separate tubes and analyzed on day 5, 10 and 15 of its sub-culturing. The lyophilized (Gr. IIA) sample of P. vulgaris was subjected to Mr. Trivedi’s biofield treatment followed by retreatment after storing for 143 days in revived state (Gr. IIB, Study II). The treatment groups in sealed pack were handed over to Mr. Trivedi for biofield treatment under laboratory conditions. Mr. Trivedi provided the treatment through his energy transmission process to the treated groups without touching the samples. Treated samples were assessed for antimicrobial sensitivity, biochemical reactions, and biotyping as per experimental design. Whilst handing over these cultures to Mr. Trivedi for retreatment purposes, optimum precautions were taken to avoid contamination. The 16S rDNA gene sequencing of P. vulgaris was also carried out to confirm the identity of sample after biofield treatment. Investigation of antimicrobial susceptibility of P. vulgaris was carried out with the help of automated instrument, Micro Scan Walk-Away® using NBPC 30 panel. The panel can be stored at 2 to 25ºC for analysis. The panel was allowed to equilibrate to room temperature prior to rehydration. All opened panels were used on the same day. The tests carried out on Micro Scan were miniaturized of the broth dilution susceptibility test that has been dehydrated. Briefly, the 0.1 mL of the standardized suspension of P. vulgaris was pipetted into 25 mL of inoculum water using pluronic and inverted 8 to 10 times and inoculated, rehydrated, and then subjected to incubation for 16 hours at 35°C. Rehydration and inoculation was performed using the RENOK® system with inoculators-D (B1013-4). 25 mL of standardized inoculum suspension was poured in to inoculum tray. The detailed experimental procedure and conditions were followed as per the manufacturer's instructions. The antimicrobial susceptibility pattern (S: Susceptible, R: Resistant; and I: Intermediate) and MIC values were determined by observing the lowest antimicrobial concentration showing inhibition of growth . Biochemical reactions of P. vulgaris were determined using Micro Scan Walk-Away®, system with NBPC 30 panel. Preparation of NBPC 30 panel, inoculum followed by dehydration and rehydration was performed similar way as mentioned in antimicrobial susceptibility assay for analysis of biochemical reaction followed by biotype number. The detailed experimental procedures and conditions were followed as per the manufacturer's instructions . The biotype number of P. vulgaris was determined on Micro Scan Walk-Away® processed panel data report with the help of biochemical reactions data . Genomic DNA was isolated from P. vulgaris cells (Gr. IIA, sample coded as 7A) using genomic purification kit, according to the manufacturer instructions. 16S rDNA gene (~1.5 kb) fragment was amplified with the help of high-fidelity PCR Polymerase using universal primers; forward primer (5ˊ-AGAGTTTGATCCTGGCTCAG-3ˊ) and reverse primer (3ˊ-ACGGTCATACCTTGTTACGACTT-5ˊ). Amplified products were subjected to gel electrophoresis in 1.0% agarose gel, stained with ethidium bromide and visualized under UV light in a gel documentation unit (BioRad Laboratories, USA). The PCR amplified fragment was purified from the agarose gel using a DNA gel extraction kit. Sequencing of amplified product was done on commercial basis from Bangalore Genei, India. The 16S rDNA sequences obtained were aligned and compared with the sequences stored in Gen Bank database available from National Center for Biotechnology Information (NCBI) using the algorithm BLASTn program. Multiple sequence alignment/phylogenetic tree were established using MEGA3.1 molecular software . 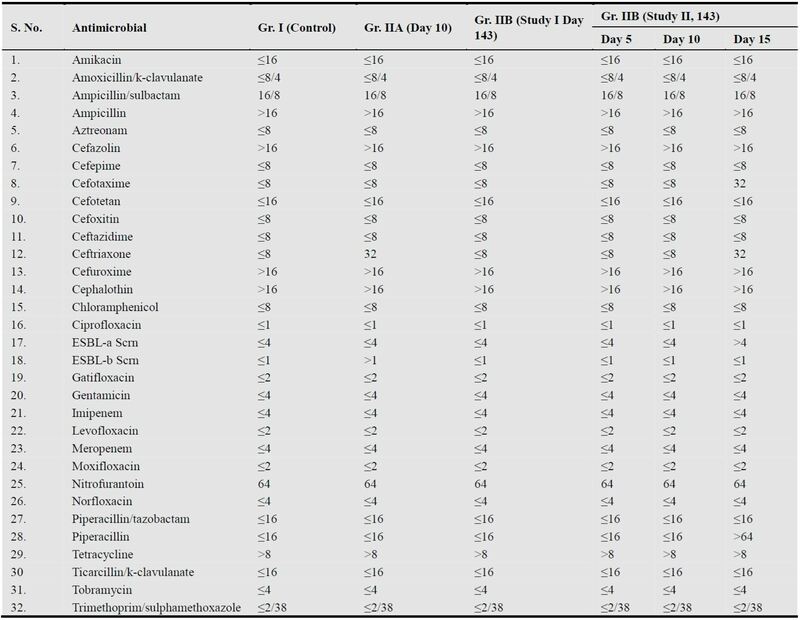 The outcome of P. vulgaris susceptibility pattern and MIC values of tested antimicrobials after biofield treatment are summarized in Table 1 and 2 respectively. The data were analyzed and compared with respect to control (Gr. I). Study was carried out of twenty-eight antimicrobials. Overall, the treated cells of P. vulgaris showed 10.71% alteration in antimicrobial sensitivity pattern as compared to control. Ceftriaxone was converted from susceptible to intermediate with increase of MIC value by four folds (≤8 to 32 µg/mL) in Gr. IIA on day 10 as compared to control (Gr. I). Further, after retreatment on day 143 it again showed intermediate with increase of MIC value by four folds (≤8 to 32 µg/mL) in Gr. IIB, Study II on day 15 while remained susceptible in other groups/time points as compared to control (Gr. I). The effect of biofield treatment cefotaxime did not alter the sensitivity pattern i.e. susceptible and MIC value in Gr. IIA on day 10 as compared to control (Gr. I). Moreover, after retreatment on day 143 it showed intermediate response with increase of MIC value by four folds (≤8 to 32 µg/mL) in Gr. IIB, Study II on day 15 while remained susceptible in other groups/time points as compared to control (Gr. I). The sensitivity pattern of piperacillin was changed from susceptible to resistant with increase MIC value by four folds (≤16 to >64 µg/mL) in Gr. IIB (Study II) on day 15 after retreatment (on day 143) as compared to control (Gr. I). However, the sensitivity pattern and MIC value of piperacillin did not change any alteration in others groups/time points as compared to control (Table 1). Rest of antimicrobials did not show any alteration either on day 10 after first treatment or followed by retreatment on day 143 as compared to control. Moreover, MIC values of ESBL-a and b Screen were slightly changed after biofield treatment as compared to control. Overall, 15.63% MIC values of antimicrobials were altered out of thirty two antimicrobials as compared to control. Rest of the antimicrobials did not show any alteration of MIC values after biofield treatment as compared to control. Table 1. Antibiogram of Proteus vulgaris: effect of biofield treatment on antimicrobial susceptibility. Table 2. Effect of biofield treatment on Proteus vulgaris to minimum inhibitory concentration (MIC) value of tested antimicrobials. Study of biochemical reactions can be utilized to identify the enzymatic and metabolic characteristic features of microbes. Microorganisms can be categorically differentiated based on their utilization of specific biochemicals as nutrients during the process of metabolism or enzymatic reactions. Table 3 shows the conventional biochemical tests necessary for the differentiation of P. vulgaris. Indole (IND) was changed from positive (+) to negative (-) reaction in lyophilized treated group (Gr. IIA) on day 10, after first biofield treatment as compared to control (Gr. I) but remained same i.e. positive (+) reaction in others groups after retreatment with respect to control. The positive reactions of IND and hydrogen sulfide (H2S) and negative reaction of oxidase (OXI) are the key feature of this organism. The control data were matched with literature . Kanamycin (K4) was converted from negative (-) to positive (+) reaction in Gr. IIB (study II) on day 15, after retreatment on day 143 while remained unchanged i.e. negative (-) in others groups as compared to control (Gr. I). 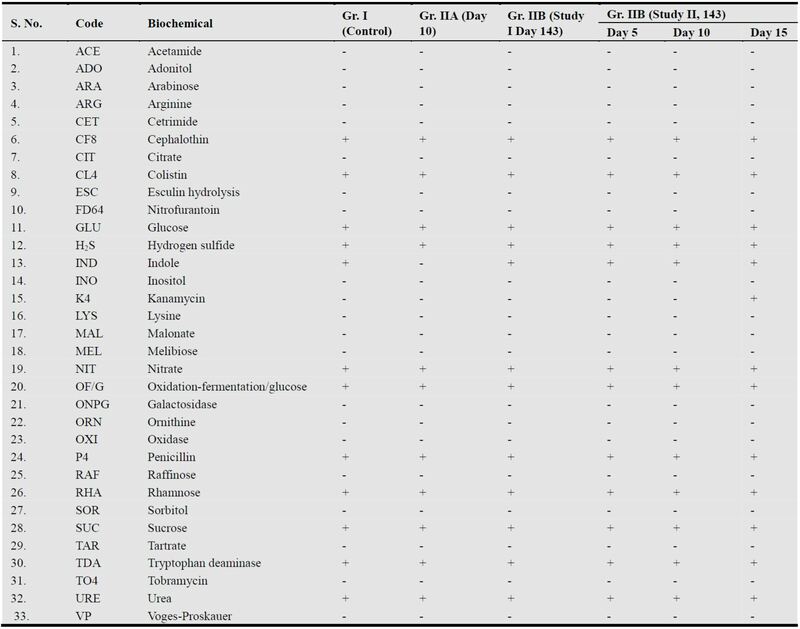 Rest of the biochemicals did not show any alteration of biochemical reactions in all the treated groups as compared to control (Table 3). Table 3. Effect of biofield treatment on Proteus vulgaris to the biochemical reaction pattern. Table 4. Effect of biofield treatment on biotype number of Proteus vulgaris. The species (P. vulgaris) was identified based on variety of conventional biochemical characters and biotyping. Biotype number of particular organism was evaluated after interpreting the results of the biochemical reactions. The biotype number then led to the particular organism identification. In this experiment, biotyping was performed using automated systems, and results showed significant change in biotype number (62060406) in the biofield treated Gr. IIA (on day 10) with identification of new species (Proteus penneri) as compared to control Gr. I (62070406; Proteus vulgaris). Rest of the groups did not show any alteration of biotype number after biofield treatment as compared to their respective controls (Table 4). The bacteria that are poorly differentiated by conventional methods needs molecular analysis method like 16S rDNA sequence . This molecular based technique is suitable tool for identification of most of bacteria on their genus and/or species level by comparison with databases in the public domain. Because, most of bacteria have small ribosomal subunit with their species-specific variability . The 16S rDNA sequence was determined in P. vulgaris on Gr. IIA sample. The alignment and comparison of the gene sequences were performed with the sequences stored in GenBank database available from NCBI using the algorithm BLASTn program. Based on nucleotide homology and phylogenetic analysis the microbe (Sample 7A) was detected to be P. vulgaris (GenBank Accession Number: DQ499636). The nearest homolog genus-species of P. vulgaris was found to be Proteus hauseri (Accession No. DQ885262) with 95% identity. Some other close homologs of P. vulgaris were to be found from the alignment as shown in Table 5. The distance matrix based on nucleotide sequence homology data are presented in Table 6. Phylogenetic tree was established using BLAST-Webpage (NCBI). According to Fig. 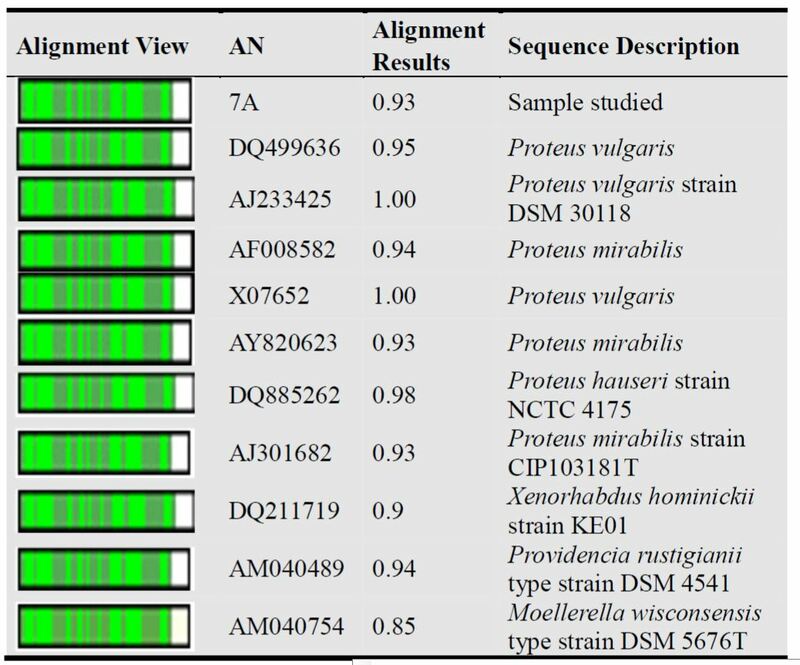 1, ten different related bacterial species of P. vulgaris were selected as Operational Taxonomic Units (OTUs) in order to investigate the phylogenetic relationship of P. vulgaris. There were 1507 base nucleotides of 16S rDNA gene sequences which were analyzed and multiple alignments were constructed using ClustalW in MEGA3.1. The numbers of base substitutions per site from pairwise distance analysis between sequences are shown in Table 5. All results were based on the pairwise analysis of 11 sequences. According to the data in Table 6, the lowest value of genetic distance from P. vulgaris was 0.004 base substitutions per site. This value is due to the distance between P. vulgaris and Proteus hauseri. All pairwise distance analysis was carried out using the p-distance method in MEGA3.1. The proportion of remarked distance, sometimes also called p-distance and showed as the number of nucleotide distances site. Values in Table 5 are programmed into Figure 1 with optimal bootstrap consensus tree. In the phylogram, there were eleven OTUs. The results suggested that P. vulgaris was found to be closely related to the Proteus hauseri with genetic distance 0.004 base substitutions per site (Fig. 1). Figure 1. Phylogenetic tree of the partial 16S rDNA gene sequencing of C. braakii using MEGA 3.1 software using neighbor joining method. Numbers represent GenBank accession number. Biofield treatment might be responsible for alteration in microorganism at genetic level and/or enzymatic level, which may act on receptor protein. While altering receptor protein, ligand-receptor/protein interactions may altered that could lead to show different phenotypic characteristics . Biofield treatment might induce significant changes in lyophilized strain of P. vulgaris and altered antimicrobials susceptibility pattern, MIC values, biochemical reactions, which ultimately change the biotype number of microorganism. As a result, the microbe that was susceptible to a particular antimicrobial in control sample now converted into intermediate/resistant in treated cells of P. vulgaris predominately after biofield treatment. In this experiment, the main objective was to see the impact of Mr. Trivedi’s biofield treatment on an opportunistic hospital acquired pathogen of P. vulgaris in in vitro. Based on findings of antimicrobial susceptibility pattern of ceftriaxone and cefotaxime showed that the susceptible nature of both control samples and it became intermediate on both day 10 (short-term effect) as well as day 143 (sustained effect). So far our group had been published many research articles regrading short-term effects on biofield treatment on ATCC and multidrug resistant (MDR) strains [14-16]. This is the first report exploring the sustained effects of Trivedi’s biofield treatment on microorganism i.e. P. vulgaris. Based on these results, it is expected that biofield treatment has the scope to be an alternative approach than the existing antimicrobial therapy in near future. Table 5. The closest sequences of P. vulgaris from sequence alignment using NCBI GenBank and ribosomal database project (RDP). Table 6. Distance matrix of P. vulgaris sample based on nucleotide sequence homology (using kimura-2 parameter). Altogether, the biofield treatment showed 10.71% alteration in antimicrobial susceptibility pattern with 15.63% change in MIC values of tested antimicrobials against the strain of P. vulgaris. It also altered the biochemical reactions pattern and biotype number of biofield treated strain of P. vulgaris. Based on changed biotype number after biofield treatment, new species were identified as Proteus penneri (62060406) in lyophilized cells (Gr. IIA) on day 10 with respect to control Gr. I (62070406; Proteus vulgaris). Thus, Mr. Trivedi’s unique biofield treatment could be applied as alternative therapeutic approach against antimicrobials resistance. Molecular based 16S rDNA analysis showed that the treated lyophilized sample in this experiment was Proteus vulgaris. However, the nearest homolog genus-species was found to be Proteus hauseri. Based on these results, it seems that biofield treatment could be used as alternate of existing drug therapy in future. Bahashwan SA, El Shafey HM (2013) Antimicrobial resistance patterns of Proteus isolates from clinical specimens. ESJ 9: 188-202. Herter CA, Broeck CT (1911) A biochemical study of Proteus vulgaris Hauser. J Biol Chem 9: 491-511. Ghaidaa M, Yanchang W, Abdallah H (2013) The effect of p-nitrophenylglycerol on swarming and the production of some virulence factors in Proteus vulgaris. N Y Sci J 6: 8-14. O'Hara CM, Brenner FW, Miller JM (2000) Classification, identification, and clinical significance of Proteus, Providencia, and Morganella. Clin Microbiol Rev 13: 534-546. Burr HS (1957) Bibliography of Harold Saxton Burr. Yale J Biol Med 30: 163-167. Hammerschlag R, Jain S, Baldwin AL, Gronowicz G, Lutgendorf SK, et al. (2012) Biofield research: A roundtable discussion of scientific and methodological issues. J Altern Complement Med 18: 1081-1086. Movaffaghi Z, Farsi M (2009) Biofield therapies: Biophysical basis and biological regulations? Complement Ther Clin Pract 15: 35-37. Trivedi MK, Tallapragada RM (2009) Effect of super consciousness external energy on atomic, crystalline and powder characteristics of carbon allotrope powders. Mater Res Innov 13: 473-480. Patil SA, Nayak GB, Barve SS, Tembe RP, Khan RR (2012) Impact of biofield treatment on growth and anatomical characteristics of Pogostemon cablin (Benth). Biotechnology 11: 154-162. Fader RC, Weaver E, Fossett R, Toyras M, Vanderlaan J, et al. (2013) Multilaboratory study of the biomic automated well-reading instrument versus Micro Scan Walk Away for reading MicroScan antimicrobial susceptibility and identification panels. J Clin Microbiol 51: 1548-1554. Kumar S, Tamura K, Nei, M (2004) MEGA3: Integrated software for molecular evolutionary genetics analysis and sequence alignment. Brief Bioinform 5: 150-163. Drancourt M, Bollet C, Carlioz A, Martelin R, Gayral JP, et al. (2000) 16S ribosomal DNA sequence analysis of a large collection of environmental and clinical unidentifiable bacterial isolates. J Clin Microbiol 38: 3623-3630. Vandamme P, Pot B, Gillis M, De Vos P, Kersters K, et al. (1996) Polyphasic taxonomy, a consensus approach to bacterial systematics. Microbiol Rev 60: 407-438. Lindstrom E, Mild KH, Lundgren E (1998) Analysis of the T cell activation signaling pathway during ELF magnetic field exposure, p56lck and [Ca2+]i-measurements. Bioeletrochem Bioenerg 46: 129-137.